or we can have these cut into any shape. 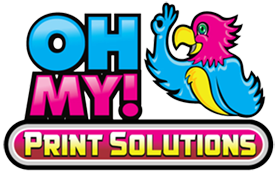 Foamcore Printing is available in sheets up to 4 x 8 feet. Foam Board can be cut into virtually any shape, including scored and folded. We recommend Foam Board rather than coroplast due to the higher quality and similar price. Does not have that corrugated look like coroplast. Intended for indoor use, but can be used outdoors on sunny days for short term. Foamboard is an inexpensive, typically temporary indoor sign that is of high quality. They are excellent for trade shows, presentations and more. Coroplast printing, Gator board or Aluminium. Foam Core is the original graphic arts Foam Board with a great reputation for temporary signage.
. Foamcore Board can be used as a backing for indoor displays. It can be scored and converted into appealing and unique displays for your business. This is for indoor use only but can repel water better than unprinted cardboard. This has excellent strength and is not as prone to warping as cardboard, although it can warp if not cared for properly. We can provide lamentation for longer term use. Why Choose Foam core Printing Board?